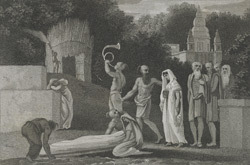 Engraving of the procession of a Hindu woman to the funeral pile of her husband by William Skelton (1763-1848) after William Hodges (1744-1797). Plate 9 of William Hodges 'Travels in India, during the years 1780, 1781, 1782, & 1783' published in London in 1793. In Benares (Varanasi), Hodges witnessed a sati ceremony in which a Hindu woman was burnt on a funeral pile with the body of her dead husband. He described the procession as 'slow and solemn; the victim moved with a firm and steady step; and, apparently with a perfect composure of countenance'.